Continuing what is a dominant run of form, Alejandro Valverde today clocked up his fourth win of the season despite only racing a handful of days thus far in 2013. The Spaniard successfully defended his overall title in the Vuelta a Andalucia Ruta Ciclista Del Sol, securing the final victory by grabbing his second stage win in this year’s edition. Valverde outsprinted a select group of riders at the end of the mountainous 182.7 kilometre stage to Rincon de la Victoria, beating Simon Spilak (Katusha), Davide Rebellin (CCC Polsat Polkowice), Bauke Mollema (Blanco Pro Cycling Team) and eight others to the line. He had previously taken the opening prologue and thus led the race from start to finish. “Honestly, we couldn't have ended this race in a better way,” he said afterwards. It all went a bit like planned in the morning, when we always had the idea of letting a break go and having the other teams pulling at the front of the bunch. It went that way, and at the final climb, the pace by Nairo made impossible that anyone could jump away. Closest rival Jurgen van den Broeck (Lotto Belisol) had started the day seven seconds back and couldn’t make any inroads at all into reducing his deficit. He rolled in sixth on the stage and finished second overall, with Mollema and Spilak third and fourth. 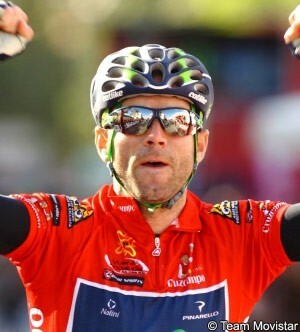 In addition to his two stage wins plus his overall success, Valverde also clocked up victory in the Trofeo Serra de Tramuntana on February 5th. Given that he’s only raced seven days in 2013, that represents a win ratio of over fifty percent. He’s understandably pleased, but also a little confused. “I think that this is my best ever start for a season, and I'm the first one who is surprised about that,” he said, thanking his Movistar team-mates for their help. “I cannot say I'm not well, because you can't win in bad form, but I wasn't expecting to do so well here.